Having a basic understanding of your boat battery will help keep you running when you are on the water. There are two primary types of 12 Volt fishing boat batteries: a starter or cranking battery and a deep cycle boat battery. Some manufacturers offer a third type of battery that is a combination of both. They are also classified by application and how they are made. You will find batteries for Automobile, Marine, RV and virtually every other application you can think of. Also there are 3 primary types of battery construction. All these types of batteries, their applications, and construction types can make the battery decision seem complicated. Some newer batteries are made virtually maintenance free, other than recharging or trickle charging. 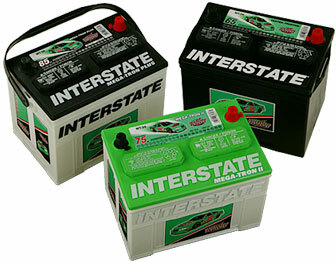 Interstate Battery is a trusted supplier of a wide variety of batteries. Differences in batteries are best thought of by thinking about how the battery will be used. A battery used to start a motor will need to deliver a strong 12 volts for a short period of time, over and over again. A bilge pump that does not draw many amps nor used often can easily run off a starter battery. For some electronics, such as depth finders, which are intended to run for the entire time you are on your boat you should count on a different type of battery. For this application a battery that is designed to deliver 12 volts for a long period of time is needed - these batteries are called deep cycle batteries. They are built to deliver 12 volts for a long period of time, then when run down be recharged back to 12 volts and do this over again. 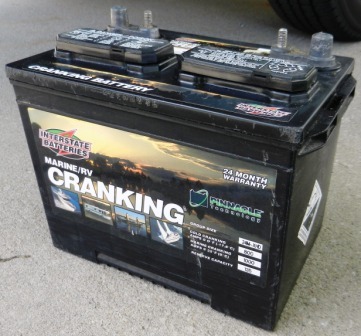 The 12 volt boat battery that we are most used to seeing is a car starter battery. This battery not only starts the motor but also provides the basic source for all electrical devices in the car. There is one big difference between automobile and marine applications - your car battery is meant to start the car with a short burst of energy and then be used while the car is running to provide power for the needs of the car. Your cars alternator charges the battery with surplus energy keeping it at top power and ready for your next start. In contrast, marine electrical applications are still running when your main motor is not running and could easily discharge a starter boat battery. This boat battery has been designed for a Marine or RV application basically to start your motor. Each motor has certain specifications as to how much reserve power is needed to turn the motor over and get it to start. This is the starter battery is installed in a 21 foot walleye boat and to start a Mercury Optimax 200 HP motor. It has 800 CCA and 1000 MCA. Marine starter/cranking batteries have been designed to give short bursts of energy many times over. Once the engine is running an alternator is generating power that is sending a charge to the battery and also helping to power the electronics. There are many applications on a fishing boat that are needed to work when the main engine is not running. While a starter battery can run small electrical devices such as navigation lights, these batteries are not designed to be deeply discharged which would happen when running an electrical device all day such as a trolling motor for example. In fact using a starter battery to run electronics that run while the alternator is not on, can actually shorten the life expectancy of the starter battery. They are not designed to be deeply discharged with a continuous power drain. 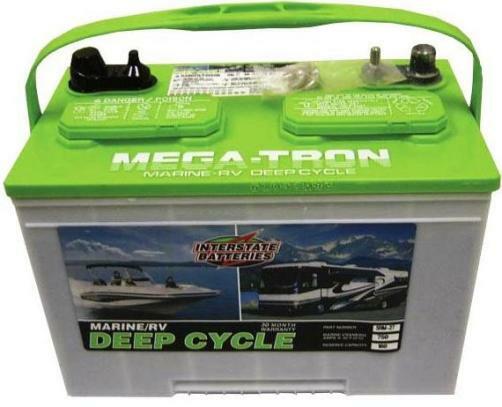 A Deep Cycle Boat Battery is designed for Marine or RV usage to power accessories over a period of time, and when discharged to be recharged over and over again. Its application most often on a fishing boat is to power trolling motors. However, this battery is also excellent for powering several electrical accessories such as depth finders, power wash down pumps, Marine Radios, and auxiliary power plugs which might be used to plug in a 12 volt electric fillet knife. Some or all of which may be in use at the same time. Here is a deep cycle battery that has been installed to run the majority of electronics that are in use all day even when the main motor is not running. It is rated to run nearly 21 hours with a 5 amp draw on its power. A great on board charger for up to three batteries, ProMariner. Recharge two trolling motor batteries and your starter battery at the end of a day and be ready to hit the water the next morning.